Home › Credit Cards › What Is A Good APR For A Credit Card? What Is A Good APR For A Credit Card? When you carry a credit card balance, you will be charged an interest rate by your credit card company. The interest rate is called the APR or annual percentage yield. But how do you know what is a good APR for a credit card? Credit card APR rates usually fall into a range that can be as low as 0% or as high as 29.99%. A rule of thumb is the lower your credit score, the higher your credit card APR rate. And conversely, the higher your credit score, the lower your credit card APR rate. Other factors like your credit card balance, income, and other debt may affect your APR rate too. Of course, if you pay off your credit card balance each month in full, APR rates don’t apply. And because APR rates can be steep, especially if you have bad credit, the best money-saving approach is to pay off your credit card balance in full every month. What is a Good APR? 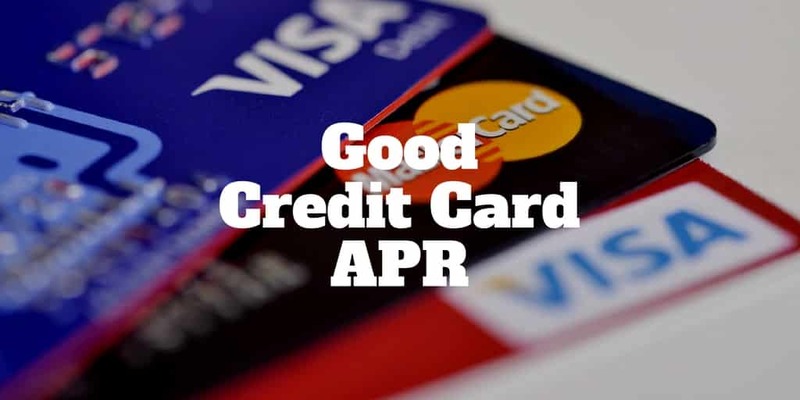 The answer to the question “what is a good APR?” varies depending on factors like the current interest rate environment, your creditworthiness, and the type of credit card you have. After the stock market crash of 2008-9, the Prime Rate to which credit card interest rates are tied was very low. A good APR rate for a credit card in the following decade was under 13%, which was close to the average APR charged to cardholders according to official statistics. But if you were to ask credit cardholders the same question in the 1980s when interest rates were much higher, they would have told you a good APR for a credit card was north of 20% because the Prime Rate was so much higher. So the takeaway is when a Fed rate hike takes place, APR rates tend to increase. The APR rate you will be charged also depends on how much risk you pose in the eyes of the credit card company. Your credit card issuer tries to assess how likely it is that you will default on your credit card debt. If you have bad credit, a good APR rate may be north of 20%. On the other hand, if your credit is excellent, a good APR rate may be as low as 11%. Some credit unions even provide APR rates under 10%. If you are not sure what your credit score is, visit MyFICO to request a free credit report. Good APR rates also vary by the type of credit card you are selecting. When you choose a credit card with generous cash or miles rewards, you may be stung with higher APR rates. On the other hand, balance transfer cards, such as the Discover It – 18 Month Balance Transfer Offer may have lower APR rates because they usually have few other perks. The type of credit card you have will affect the APR rate. For example, business credit cards generally have much lower average APR rates than student credit cards or cash back credit cards. Business credit cards enjoy the lowest average APR rate because they are perceived to be less risky. Cash back credit cards are penalized most when it comes to APR rates because if you are using your credit card for a cash advance, it may signal that you have been unsuccessful in borrowing elsewhere or need money in a hurry. A good credit score is one of the most important factors to help you get a good APR. If you are not sure what your current credit score is, you can request a copy of your credit report from MyFICO. Paying off your credit card balance in full each month goes a long way towards building your credit score and qualifying for lower interest rates not just on credit cards but on other debt too, such as student loans and mortgages. The amount of available credit you use each month is called your credit card utilization. Credit card companies use this metric to evaluate how much risk you pose. If you are maxing out your credit each month, it may highlight that you are hitting your financial limits. Ideally, keep your credit card utilization below 35% each month to show your credit card issuer that you are living within your means. An easy way to boost your credit score is to remove errors from your credit report. You can report inaccuracies to the three major credit reporting bureaus, Equifax, Transunion, and Experian. A late payment that has been incorrectly reported or incorrect account information may be hurting your score but the good news is both can be easily fixed. You may not be getting the credit you deserve from timely bill payments you are currently making. For example, many landlords do not report on-time rent checks to credit bureaus. Companies like RentTrack and Rental Kharma solve this problem by reporting your payments so that you can build your credit without having to take on any debt or even take out a credit card. Credit report inquiries won’t necessarily hurt you. Credit card companies and lenders know that consumers shop around for the best rates so if you make a few inquiries within a 30 day period you will usually not be penalized. However, a large number of inquiries over a 12 month period can penalize your credit score. The rule of thumb is to make fewer than five inquiries that result in hard credit checks over any twelve month period. Don’t worry about soft credit checks. These won’t affect your credit score and are usually performed as part of background checks or to see if you qualify for a credit card. If you ever missed a payment to your credit card company, you may be charged a penalty APR rate. But what is a penalty APR? A penalty APR rate is a higher interest rate charge that is applied to your credit card balance which takes effect when you are more than 60 days delinquent in making a minimum payment. Penalty APR rates can be as much as twice the level of normal APR rates. And the kicker is they are not easy to remove. Your credit card company will take a dim view of you missing a minimum balance payment over a 60 day period. It effectively means you didn’t pay them even the minimum amount in two consecutive periods, so it suggests that you are financially struggling. If you missed payments because you were ill or for some medical condition that rendered you unable to make payments, call your credit card issuer and explain the situation. They may be willing to reinstate the normal APR rate. A good credit card APR rate will depend on the type of credit card you hold, your creditworthiness, and the interest rate environment. Cash back credit cards and student credit card typically suffer from the highest average APR rates compared to travel reward credit cards and business credit cards. Cardholders with bad credit will often be hit with APR rates north of 20% unless they choose a balance transfer card, which features a grace period of low or no-interest rate charges. If you have excellent credit, you could enjoy APR rates in the low teens or even under 10% from some credit unions. During high interest rate environments, APR rates for all credit cards tend to rise because they are all tied to the Prime Rate. The best way to enjoy lower APR rates is to make regular payments, and at the very least, pay off your minimum balance each month. Ideally, spend less than your credit limit too in order to keep your credit utilization rate low. And if you believe you are paying high APR rates unnecessarily, double check with the main credit bureaus, Experian, Equifax, or TransUnion, to ensure no errors feature on your credit report. Do you have a better handle now on what is a good APR rate for a credit card? Let us know what other factors have affected the APR rates you pay. We would love to hear from you. >> Is Discover It® The Best Balance Transfer Card? >> Is Chase Sapphire Reserve The Best Travel Credit Card? ‹ What Is A Fair Credit Score?